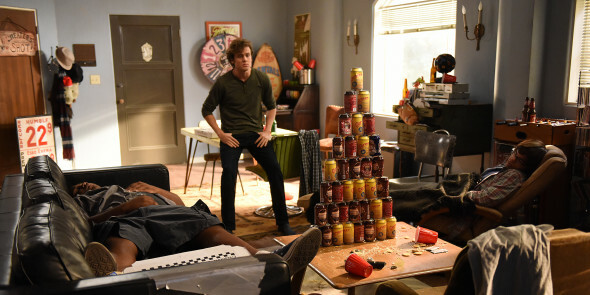 COOPER BARRETT’S GUIDE TO SURVIVING LIFE: L-R: Meaghan Rath as Kelly, Jack Cutmore-Scott as Cooper, James Earl as Barry, Charlie Saxton as Neal, Justin Bartha as Josh, and Liza Lapira as Leslie. © 2016 / FOX Broadcasting Co. CR: Jeff Lipsky / FOX. Will Cooper Barrett’s Guide to Surviving Life survive its first season? FOX is preempting the April 24th episode. It will be replaced by a rerun of the The Simpsons, season 27 episode, “Paths of Glory.” The preemption comes just weeks after FOX moved Cooper Barrett from 8:30pm to 7:30 and shifted Bob’s Burgers to its old slot. None of this is good news. Cooper Barrett’s Guide to Surviving Life is likely to be cancelled. A freshman sitcom, Cooper Barrett’s Guide to Surviving Life is told from the perspective of Cooper Barrett (Jack Cutmore-Scott). Newly out of college, Cooper lives with his best friends, as he figures out what to do with his life. Also starring are Meaghan Rath, James Earl, Charlie Saxton, Justin Bartha, and Liza Lapira. The episode set to air this Sunday, April 17, “How to Survive Your Parents’ Visit,” features guest stars Alan Ruck and Jane Kaczmarek as Cooper and Josh’s (Bartha) parents, Mark and Cindy Barrett, and Rapper Juicy J, as himself. Will it be the last? COOPER BARRETT’S GUIDE TO SURVIVING LIFE. Jane Kaczmarek and Alan Ruck guest star in the “How to Survive Your Parents’ Visit” episode. Cr: Michael Becker / FOX. © 2016 FOX Broadcasting Co.
COOPER BARRETT’S GUIDE TO SURVIVING LIFE. 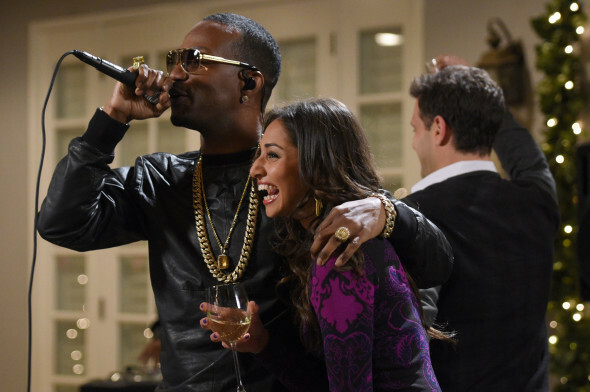 L-R: Guest star Juicy J, Meaghan Rath and Justin Bartha in the “How to Survive Your Parents’ Visit” episode. Cr: Michael Becker / FOX. © 2016 FOX Broadcasting Co.
During its first season, the Cooper Barrett’s Guide to Surviving Life TV series has struggled in the ratings. As of the April 10th episode, it had a season average of 0.95 in the 18-49 demographic and an average total audience of 2.134 million viewers. Those numbers do not tell the whole story, though. From mid-February to early March, Cooper Barrett’s demo average was hovering between 0.75 and 0.83 and the total audience size was between 1.7 and 1.95 million viewers (roughly). After the March 13th episode, the show was off the air until April 3rd. That April return is the week the ratings plummeted. On March 13, Cooper Barrett’s Guide earned a 0.83 in the demo and drew a total audience of 1.952 million viewers. On April 3, those numbers dropped by nearly half; the show racked up a paltry 0.44 in the demo, with a total audience of 0.966 million viewers. COOPER BARRETT’S GUIDE TO SURVIVING LIFE. 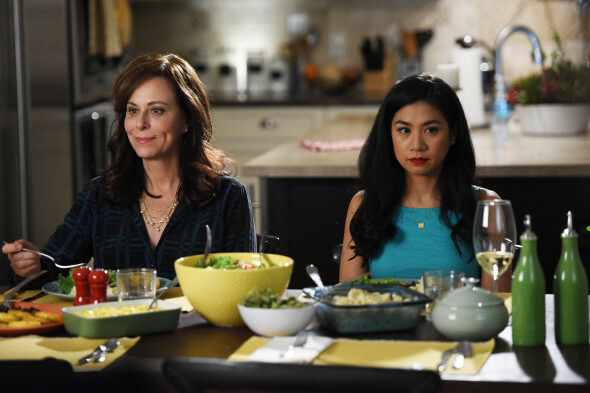 L-R: Guest star Jane Kaczmarek and Liza Lapira in the “How to Survive Your Parents’ Visit” episode. Cr: Michael Becker / FOX. © 2016 FOX Broadcasting Co. The numbers on April 10 were up, but only slightly (0.50 demo/1.089 million viewers). The new, animated Bordertown TV show earned similar ratings in both weeks. FOX ordered 13 episodes of Cooper Barrett’s Guide to Surviving Life. This coming Sunday’s episode will be the 10th to air. Whether FOX will burn off the last three episodes, or leave them in the can, is still up in the air. COOPER BARRETT’S GUIDE TO SURVIVING LIFE. L-R: James Earl, Jack Cutmore-Scottand and Charlie Saxton in the “How to Survive Your Parents’ Visit” episode. Cr: Michael Becker / FOX. © 2016 FOX Broadcasting Co.
FOX has only released its schedule through May 1st. “The Girl Code” episode of The Simpsons is set to air at 7:30pm, that night, leading in The American Country Countdown Awards. As we learn more about Cooper Barrett’s fate, we will let you know. What do you think? Are you a fan of the Cooper Barrett’s Guide to Surviving Life TV show? Do you think it should be cancelled or renewed? Tell us!